Now is the time to start thinking about your summer events, festivals and do I dare say the ‘C’ word?… (Christmas). Don’t worry, we’re here to help you stay ahead of the game. This March we have an offer which will make your head bang! Surely this can’t be true? 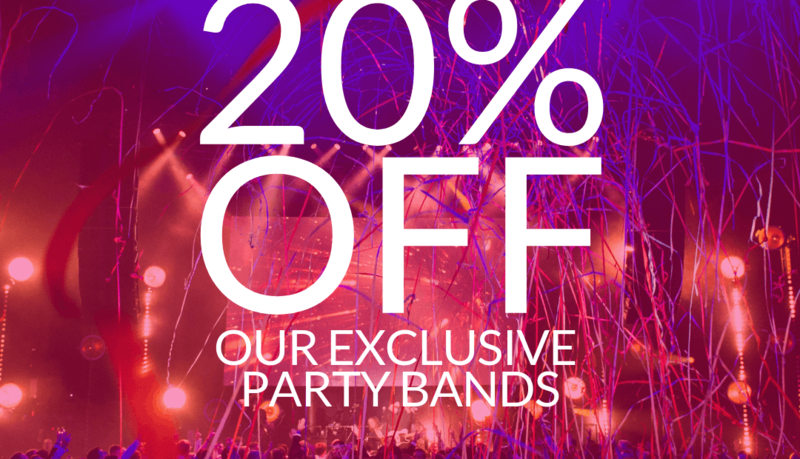 But it is, 20% off our exclusive party bands. These four bands, exclusive to R&R, are the absolute best at what they do – full of passion, energy and audience interaction as well as being incredible musicians! Including: The Kings, The Electric, The RPJ Band and Supergroup. The regal power of rock and pop! Fronted by the vocally majestic Mitchel Emms (finalist on BBC’s The Voice), this line up is ready to reign. They’ve got energy, stacks of talent and some of the most creative song mashups you could possibly think of! To find out more CLICK HERE. Classy, sassy, full of energy yet utterly spectacular they are the perfect entertainment for any event. Killer songs with incredible vocals and amazing musicianship, this is a show band like of which you have never seen before. To find out more CLICK HERE. Turning events into full blown concerts! They will have your audience on their feet, hands in the air and in full rock pose from the very first song. Whilst their performance may look spontaneous it is actually a well-oiled, slick machine – made up of the UK’s top session musicians, incredible vocals and TOTAL audience engagement. To find out more CLICK HERE. Wowing audiences with their energy and showmanship! This band is a true supergroup in every sense of the word. When they’re not touring with the biggest named celebrity artists they are performing together as a supergroup at corporate events, award shows and private parties all over the world. To find out more CLICK HERE. We hope to see you soon to turn your event into something like this… GIF: RPJ Band! Quote offer code ‘MARCHMADNESS19’ to qualify. Offer applies only to R&R exclusive party bands RPJ band, The Kings, The Electric and Supergroup. Contract and deposit must be submitted by 5pm (GMT) on Friday 29th March 2019. Offer only applies to new enquiries and bookings. Subject to availability of band. Offer may be withdrawn at any time without notice. All original booking terms apply including Tech Spec and Artist Rider requirements.